Here is Thoma's reply to my last post. Let's see what he says. Saying that inflation is always and everywhere a monetary phenomena, and that prices depend upon the amount of outside money in the system, doesn't answer the question about how we get inflation before aggregate demand kicks up. I don't know what "aggregate demand" is. That's in a language I can't make any sense of. Exactly how the excess reserves leave banks in a depressed economy is not explained other than through reference to some vague friction that says banks won't want to hold reserves. Presumably Mark would characterize the current state of the economy as "depressed." 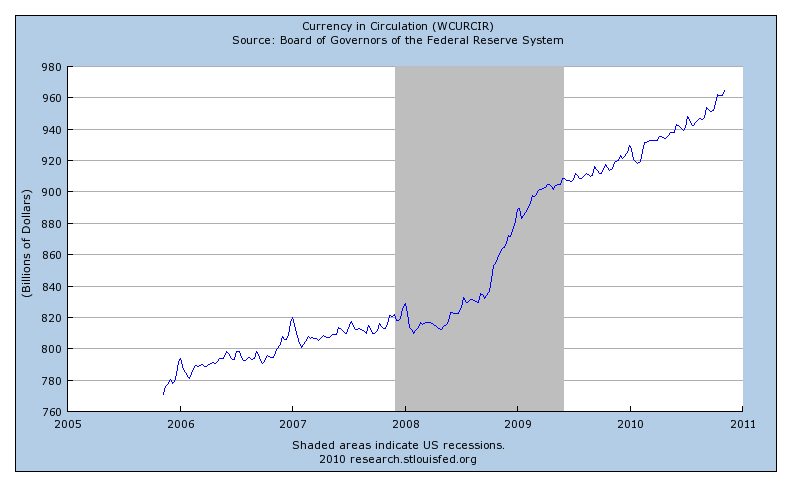 And, the fact is that reserves are leaving banks in the form of currency as we can see in this chart. Note in particular that reserves have recently been leaving banks at a more rapid rate. It's possible that we would get more inflation even without QE2. Is the supply of credit the main constraining factor or is it the demand? A contributing factor could be that some banks are capital-constrained. It would help to know where the reserves are in the system. Someone at the St. Louis Fed is working on this. I'll find out more this week. The reserves aren't somehow converted into loans. You're thinking about the money multiplier, I think, which is misleading. If the opportunities are there, the banks will lend. In the absence of intervention that will happen, though probably not as fast as we would like. Finally, if claiming someone is a "wuss" is a key component of your argument, I suppose that's fine, but we shouldn't pretend that an opinion about someone's character is based upon any sort economic reasoning. No, I wasn't disparaging Bernanke's character. I know him well from the old days, though I haven't talked to him for a very long time, and he is a fine person. However, based on his behavior as a central banker, he may be a bit of a wuss. Buying more than $1 trillion in mortgage-backed securities was rather wussy, in my opinion. I'm thinking it's likely that, when push comes to shove, he's not going to be good on his word. There's not much science in that of course. "I don't know what "aggregate demand" is. That's in a language I can't make any sense of." If you don't like the concept of aggregate demand, then say so respectfully. No need to be so condescending and arrogant about it. Moreover, since most observers accept this notion or something similar to it, you need to explain why you are critical of it rather than being snarky. Make a case without the self-righteous tone. Why curcir from only 2006? The series extends a lot longer than that, and tends not to show a real difference from long term trend. If you think the multiplier is bogus, that’s reassuring in my book. But why would you think excess reserves have any importance for bank lending if that’s the case? IMO, the only factors important for bank lending are credit demand, credit worthy borrowers, and bank capital. Reserves are irrelevant for bank lending, whether they are $ 1 trillion or $ 2 trillion. Reserves are a special form of treasury bills that are trapped as assets in the banking system. They serve as a point of interest rate arbitrage for the risk free rate only. Excess reserves shouldn’t affect credit spreads. The banks are smart enough to know the reserves are trapped, and not quite dumb enough to chase their own tails by putting out loans or buying risky securities just to get rid of reserves that can’t be gotten rid of systemically. The system can’t get rid of them other than by Fed intervention or, as discussed in the last post, by gradual conversion into currency by the public. But the natural pace of conversion is nearly irrelevant in its materiality. While currency has been increasing, the link between that increase and the level of Excess Reserves seems tenuous. QE1 occurred as credit in the shadow banking system was collapsing. QE2 will occur as it has stabilized, and as the government continues to run high fiscal deficits. Why isn't the increase in currency merely reflective of banks buying Treasury bonds at auction with reserves? They are doing this in anticipation of selling the bonds to the Fed. In other words, why isn't a money-financed deficit the most likely cause of the increase in deposits? The Fed creates reserves, the banks lend them to the Treasury, the Treasury spends buys goods and services, creating new deposits. Required Reserves increase and Excess Reserves decline very little given the low effective reserve ratio. To JKH above: reserves are not trapped, they are being lent as can be seen in bank Treasury holdings in the H.8 report. 1. I was not trying to be condescending or snarky. That's your interpretation. To use the term "aggregate demand," I have to buy into a whole modeling framework that I think is not useful. To talk to me in terms that make sense to me, Mark has to get down to the economics of what the exogenous shocks or endogenous mechanisms are that he wants to think about. 2. I didn't have something up my sleeve in showing you only the post-2006 currency data. I wanted you to see the post-financial crisis detail more clearly. I think it's interesting that the stock of currency has been growing steadily post-crisis at about 5% per year, with a small increase in the growth rate in the last couple of weeks. It will be interesting to watch this. 3. "Why isn't the increase in currency merely reflective of banks buying Treasury bonds at auction with reserves?" When a Treasury auction happens, this typically goes into the Treasury's general account, and you see a corresponding drop in reserves held by the banks. As the Treasury spends it, it typically goes back into private sector reserves. You'll only see effects on currency if people actually want to hold more of the stuff. The government certainly is not using currency in transactions. Hayek was a famous critic of the use of aggregates in macroeconomic reasoning. “In fact, neither aggregates nor averages do act upon one another, and it will never be possible to establish necessary connections of cause and effect between them as we can between individual phenomena, individual prices, etc. I would even go so far as to assert that, from the very nature of economic theory, averages can never form a link in its reasoning”. Do you think Hayek was ahead of his time, and he was a modern micro-foundations macroeconomist, or is all of modern macro subject to his critique? "1. I was not trying to be condescending or snarky. That's your interpretation. To use the term "aggregate demand," I have to buy into a whole modeling framework that I think is not useful. To talk to me in terms that make sense to me, Mark has to get down to the economics of what the exogenous shocks or endogenous mechanisms are that he wants to think about." It's my interpretation too. This just seems like an attempt to force Thoma into your modeling framework as much as it is avoiding his. The two of you are coming from very different places and this doesn't seem to be a very productive way to bridge the gap between those places. The irony here is that even though you're rejecting the language of Keynes, your argument is very Keynesian in one sense: it seems that you're positing a sort "animal spirit" that inevitably motivates banks to increase lending and spend their reserves. One last thing. 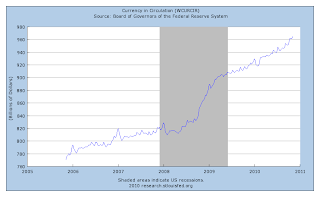 If currency in circulation predicts inflation, why doesn't it correlate with inflation? I'm willing to bet that you don't get a correlation even if you allow a delay to synchronize the curves. Aggregate demand: bu accounting definition, this is C+I+G+Ex. This is actually measured, unlike the (outdated) concept of 'social' utility. You might try to take a refresher course in National Accounting, there is something like total investments, total consumption and the like - seems you can't make sense of the language of National Accouting.